AutoPay Technology is a code based system that provides payment protection solutions that can be customized for your individual customers and their payment needs. It is an all-in-one solution for dealers, finance companies and customers. What if a customer’s device is flashing (1, 2 or 3 or the red light is flashing) and their first payment is not due yet? This is an indication that not all the install codes were entered. All the codes will need to be re-entered. Start at the bottom of the list and once a code is accepted (indicated by a triple beep) they can then enter ALL the codes from that point forward. Does it matter if a code is entered twice? No, however it does matter if a code is not entered at all. If the installer does not have the codes, can these be retrieved by going into the customer’s contract? What if the customer’s device is flashing red or solid red but no payment is due? The most common reason is a low or flat battery or bad connection to the vehicles battery. It can also be another problem with regards to the vehicle receiving power such as the transformer or the battery. What if the installer or customer insists that the battery is good? Run a self test which can be found in the operation manual. If the device still does not accept a code, it is most likely a power issue and they need to get power to the device from the battery. How do I run a self test on the unit? You can run a self test by entering the codes in the manual (see AutoPay manual page 6) Note: The installer will need to be prepared to write down the response they receive by way of flashing lights. If it is an end user running self test and they receive an error message the vehicle needs to be returned to the installer and installed correctly. What is the problem if the device has no lights with the key off? There is no power to the device. When should I enter the codes? Enter codes when the ignition key is in the off position. What if a customer tells you that the code has not been accepted? Have them press 3 & 4 at the same time – they will hear a long beep and then they can enter the code again. (Pressing 3 & 4 together clears the device and will clear a partially entered code so can be used if the customer has entered the code incorrectly and needs to start again). In addition, make sure that the dealer or finance company has given them the correct code. They can then enter either the correct code or re-enter the code they have. What if a customer (end user or dealer) has a problem they cannot rectify? Have them call their local distributor. When should the device be removed? If an end user has completed their contract, they need the device removed by the company that installed it. What happens if the customer has an emergency and the vehicle has been shut down due to non-payment? All devices have an emergency code. The code is 123412 and should ALWAYS be provided to the customer. It will not work unless the vehicle is shut down and will not turn the light green and will not stop the beeping but it will allow the vehicle to start for 24 hours. 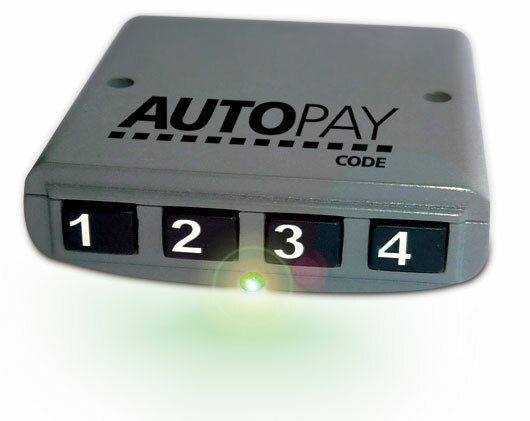 ﻿The AutoPay Code system is a hardwire starter-interrupt device that is installed in a vehicle to ensure payments are made on time by the vehicle operator. It reminds the car buyer to make their payments as they are coming due and will deny the use of the vehicle when payments are delinquent. AutoPay Technology is a code based system that provides payment protection solutions that can be customized for your individual customers and their payment needs. It is an all-in-one system for dealers, finance companies and customers.